Today marks the centenary of the deaths of two prominent citizens and political figures from Birmingham, Joseph Chamberlain and Sir Benjamin Stone. Both were born around the same time, Chamberlain in 1836, Stone 1838. Both grew up in families that were successful in local business, taking positions in their families’ respective firms before branching into local and national politics once they had built up their fortunes. Chamberlain was by far the most famous and controversial of the two. As a Liberal Councillor and Mayor of Birmingham, from 1873 ‘Radical Joe’, as he became known, instigated a number of important infrastructural reforms in the city including bringing the gas and water supply under municipal control and the Borough Improvement Scheme, 1875 (see Iron Room blog piece of 30 June 2014). His time in office saw the development of municipal infrastructure, parks and magnificent public buildings, much of which remains to this day. Despite his radical domestic agenda Chamberlain was also a staunch Imperialist. Following his election as a Liberal Member of Parliament in the mid-1870s, he eventually took a leading role in resistance within the party that helped defeat the passage of Prime Minister Gladstone’s Irish Home Rule Bill in 1885, effectively splitting the party,putting it in the electoral wilderness for the best part of twenty years. Chamberlain joined the Conservative Party, eventually landing his preferred job of Colonial Secretary. His career in his new party was even more controversial, his stewardship of the Colonies taking place at the exact same time as the notorious Jameson Raid that led to the brutal South African (Boer) War 1899-1902. Chamberlain remained an extremely popular figure in Birmingham however. The future Prime Minister David Lloyd George was almost lynched by a patriotic mob following an anti-war speech he made at Birmingham Town Hall on 18 December 1901, with Lloyd George having to be escorted out of the building in disguise by police! WK/M6/47: Exterior of Highbury Hall, Moseley, the Chamberlain family residence. Photographed by Thomas Lewis for the Warwickshire Photographic Survey c1890s. By the 1906 General Election, Chamberlain’s proposal of a policy of economic protectionism favouring Britain’s colonies split the party into free-trade and protectionist factions, leading to a Liberal landslide. Despite his reputation of being possibly the only political figure to effectively split two parties, his actions did nothing to harm the future political careers of his sons nor did it tarnish the reputation of the Chamberlain family brand in his home city. The energy he devoted to municipal politics and the great reforms and infrastructural improvements were amongst his greatest gifts to the city and the nation, hence the affection felt for him by many in the city. Not for nothing was he later referred to as ‘The Uncrowned King of Birmingham’. 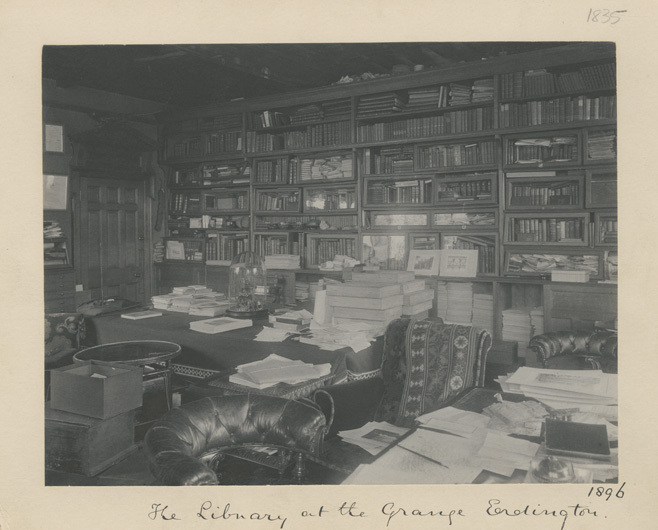 WK/E2/114: The library in The Grange, Erdington, home of John Benjamin Stone. Photographed by Stone for the Warwickshire Photographic Survey in 1897. By contrast, Stone’s political career was relatively quiet – it was in the arena of photography that Stone made his biggest impression. 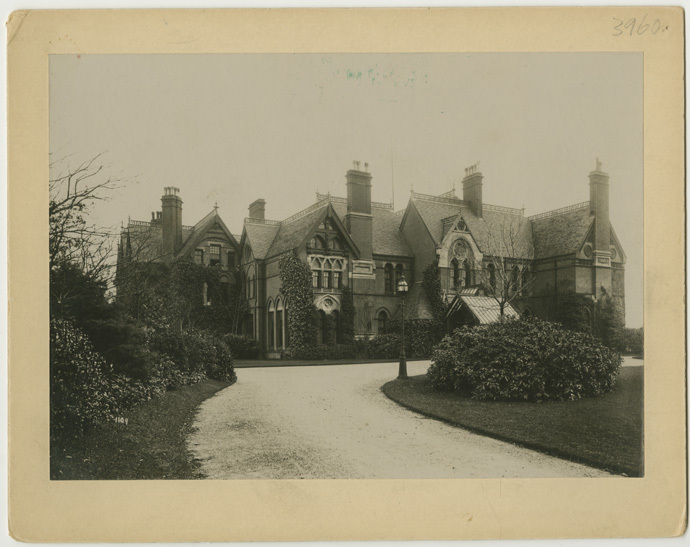 An avid collector of images as well as a keen amateur photographer, Stone built up a huge collection of negatives and photographic prints at his house at The Grange, Erdington, as well as a large library of books, journals and periodicals devoted to the hobby as well as his other myriad academic interests. His photographic work is well represented in the Library of Birmingham’s Photographic Collections. His own personal archive (Collection MS 3196) comprising tens of thousands of photographic prints, negatives and other papers. The collection has a local, national and international interest, Stone having photographed all over the world. 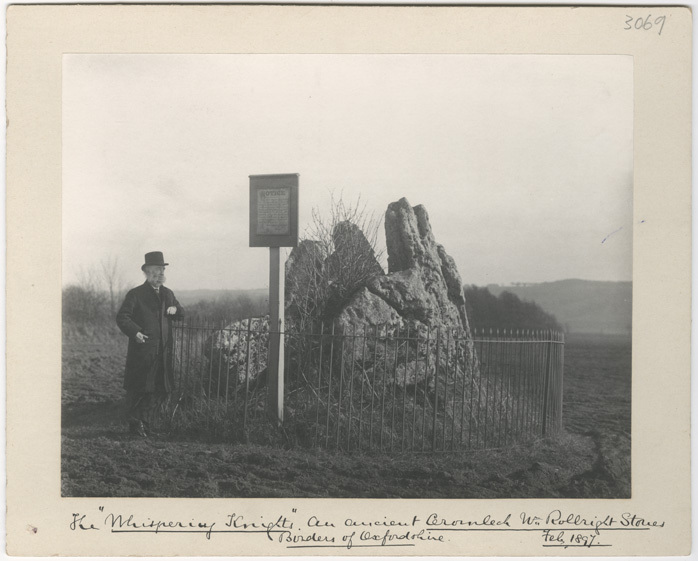 His work is also well represented in the Birmingham Photographic Society (MS 2507) and the Warwickshire Photographic Survey (MS 2724), having been appointed President of both groups. A selection of Stone’s work from his archive and the Warwickshire Photographic Survey is available on the Library of Birmingham Website. His pioneering work alongside William Jerome Harrison in the Warwickshire Photographic Survey, effectively the first photographic record of the country, inspired him to set up the National Photographic Record Association in 1897. Digitised material from this short-lived organisation is now available on the V&A Website. He also took a series of Parliamentary Portraits of members of the Houses of Commons and Lords. Digitised content is available on the National Portrait Gallery on-line resources, as well as the Stone galleries on the Library of Birmingham Website. Stone was exceptionally well-travelled, and he was keen to document ancient folk customs and ways of life of all peoples, particularly where rapid economic, social and technological change were transforming everyday life. His portraits of Native American tribes and their leaders were particularly powerful; by the end of the nineteenth century their resistance to the encroachments of white settlers moving west had practically been broken and many were forced to live on reservations. 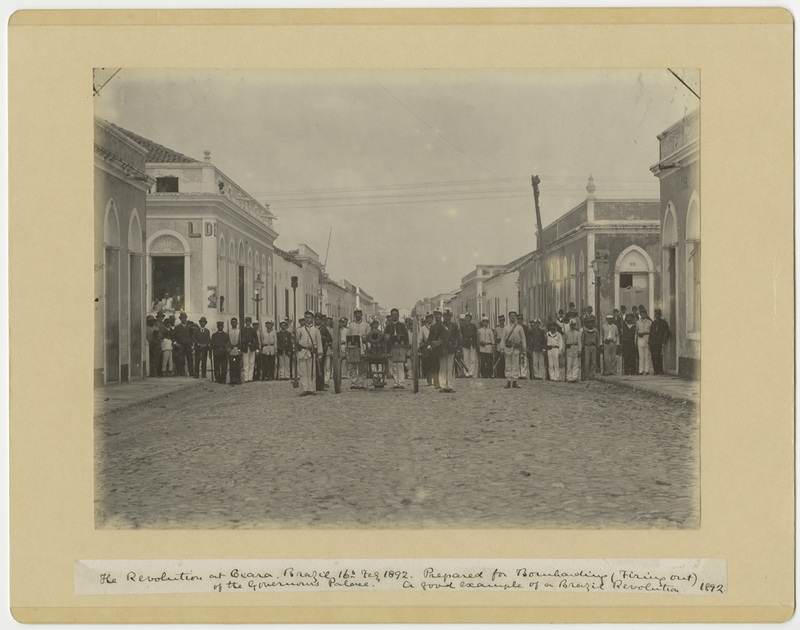 MS 3196 Box 376 Print 36: The Revolution at Ceara. Brazil 16th Feb. 1892. Prepared for Bombarding (firing out) of the Governor’s Palace. Photographed by John Benjamin Stone. “It might also be said that the camera proved mightier than the sword. At one point in Cerea a barricade was constructed by the rebels, and cannon were posted that the Governor’s palace might be shelled. 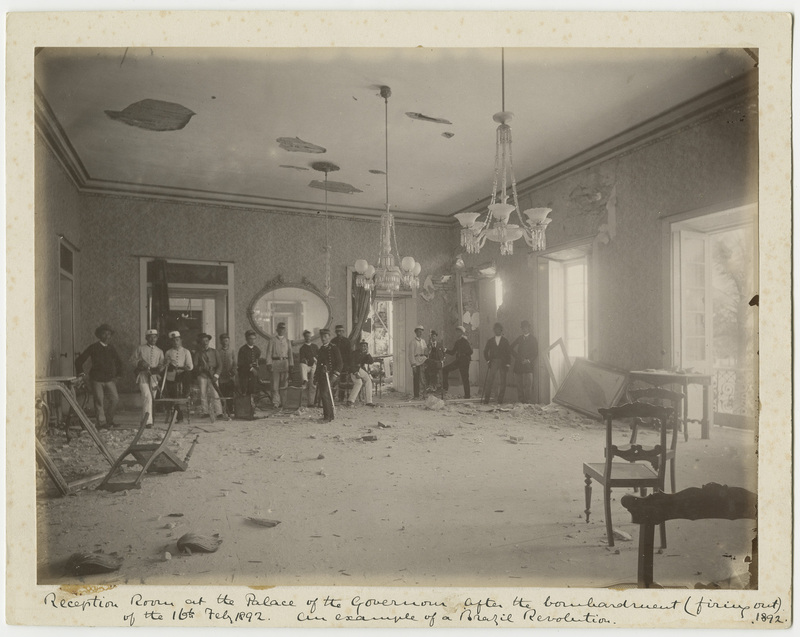 MS 3196 Box 376 Print 38: Reception Room at the Palace of the Governor after the bombardment (firing out) of the 16th Feb. 1892. Photographed by John Benjamin Stone. On the 8 July 1906, celebrations were held in Birmingham to mark Chamberlain’s seventieth birthday, who would be in the city to attend the various processions and visits to mark the big day. Photographers from the Warwickshire Photographic Survey, including Stone, were in attendance to capture the festivities for posterity. 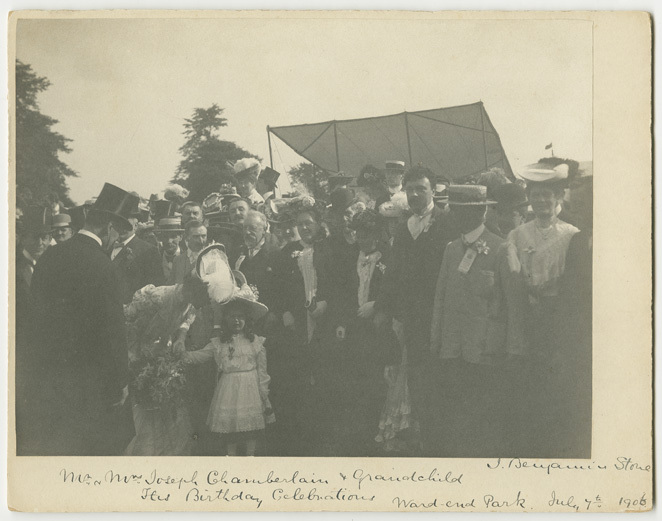 This print by Stone shows Chamberlain, his wife and other family members meeting locals and civic dignitaries at Ward End Park that day. MS 3196 Box 17 Print 16. Mr. & Mrs. Joseph Chamberlain and Grandchild. His Birthday Celebrations. Ward End Park. July 7th 1896. Photographed by John Benjamin Stone. By 1910 Stone had retired from politics due to ill-health. Despite increasing health problems, Chamberlain continued to represent his constituency as a Conservative-Unionist until January 1914. On 2 July 1914 Joseph Chamberlain suffered a heart attack and died in the arms of his wife Mary surrounded by his family. He was buried at Key Hill Cemetery following a Unitarian ceremony, in the heart of the town he grew up in, worked and represented as a Councillor, Mayor and Member of Parliament. His family had refused an official order for a burial at Westminster. Stone died at his home the very same day, his wife tragically passed away just days later. The couple were eventually buried in the parish churchyard at Sutton Coldfield, the borough he too had once represented as Councillor and Mayor, and close to the city he served as an M.P. and the home that, at the time of his death, had become a repository of visual and written records dedicated to his extensive travels and his fascination with photography and other educational interests. This entry was posted in News, Our Collections and tagged Archives, Arts, Birmingham, Birmingham History, Heritage Sector, Industry, Library of Birmingham, Local History, Parks, Photographs, West Midlands. Bookmark the permalink. Where are ‪#‎Birmingham‬’s giant political figures today? Sir Albert Bore, John Hemming (the Yardley MP famously admitted to 26 ‘affairs’) et al and MP’s like Khalid Mahmood, Shabana Mahmood MP, Gisela Stuart and Jack Dromey, who owes his pre-eminent position in politics tot his wife the fragrant Harriet Harman. 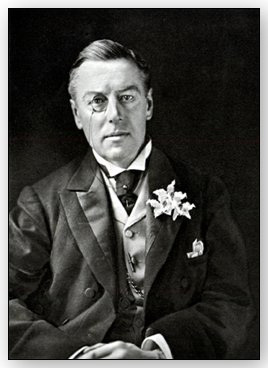 All are political pygmies in comparison to Joseph Chamberlain and The Chamberlain Files and his sons Austen (a Nobel Peace Prize winner for his work on The Locarno Pact of 1925 when he was Foreign Secretary) and Neville, the much-maligned British Prime Minister of the late 1930’s who has forever been labelled the ‘arch appeaser’ for his ‘peace in our time’ visit to Herr Hitler in Munich when he alighted his aeroplane with that little scrap of paper. As I said Neville Chamberlain was and continues to be a controversial and much-maligned man but he was a #Birmingham-born politician who strutted the world stage in comparison to today’s bunch of #Birmingham has been’s, never has been’s and never will be’s………………………..